If you do not know or have forgotten your password, just click below on “Pozabljeno geslo...” meaning “forgotten password”. You will be required to enter your e-mail address again and to copy the security code. The system will then automatically send you your forgotten password. - On the main page; from the list of your RBs on the right side, you click the RB with which you would like to enter the competition. - From the list of competitions on the left side of page, you chose the competition which you would like to enter and click “prijavi” (enter/apply). - Application form will then open. 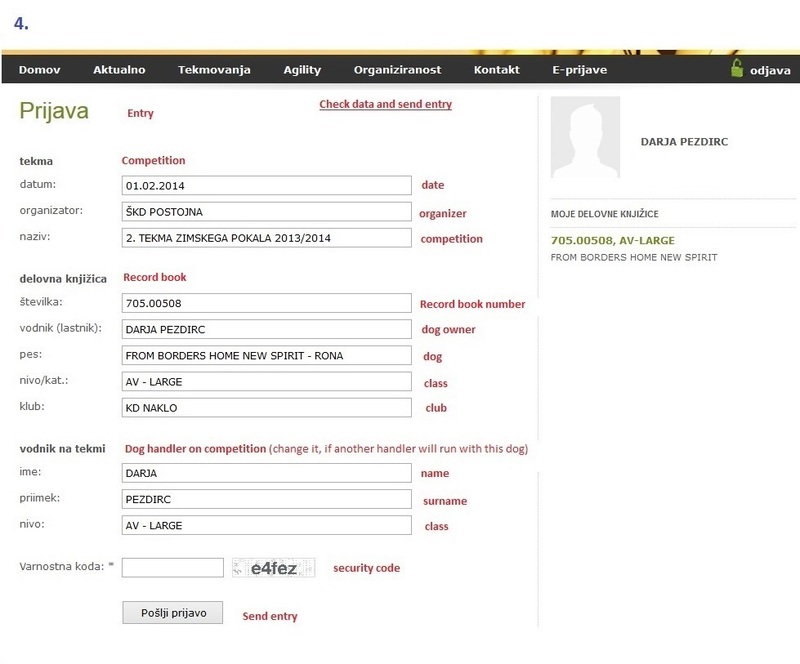 You should check your data and change the handler´s name if someone else will compete with your dog. Again you will be required to copy the security code. 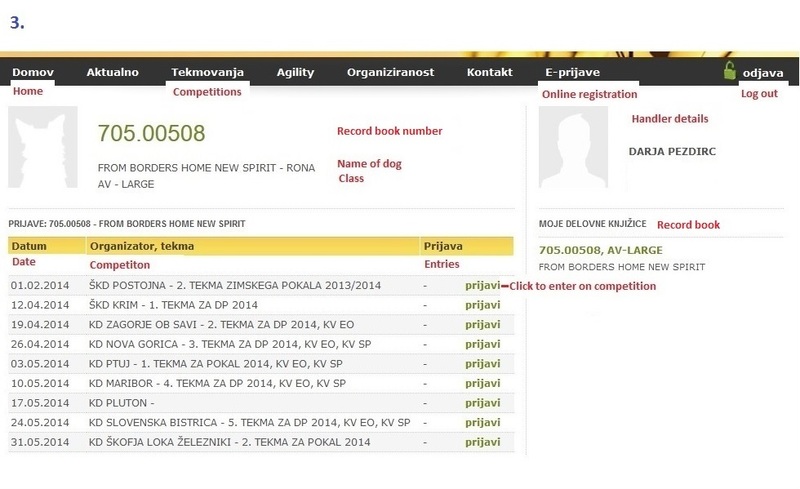 - Making sure your data is correct, click “pošlji prijavo” (Send entry) and the system will enter/add you in the competition and send a copy of your entry via your e-mail address. You can also see your entry immediately on the entry list (described in attachment 7). For a new entry click “Tukaj…” You will be returned to the main page, where you can add a new entry to a different competition but with the same RB or you can add another entry with a different RB. You can also check the applications you have already submitted – the word “DA” appears next to the name of the competition. - Click on the link “odjavi”/cancel (in proximity of the word “DA”) and repeat the previously described procedure (entry to the competition). Important: Entries and cancellations are possible until the Tuesday before competition. After Tuesday you will have to contact organizer of competition. Once you are registered online you can surf the web page and if you want to go back to online registration, just click the tab “E-prijave” (Online registration) and you are back. You are logged in until you click “odjava” (Log out). Competitiors who are not in agility base, plase fill the form "Agility new team form" and send it to Agility Commission - agility.komisija@gmail.com. System will send your ID and password on e-mail.